These are hand made Greyhound earrings with charming heart s that read, respectively, "Greyt" and "Coffee"--perfect for that person who loves BOTH! 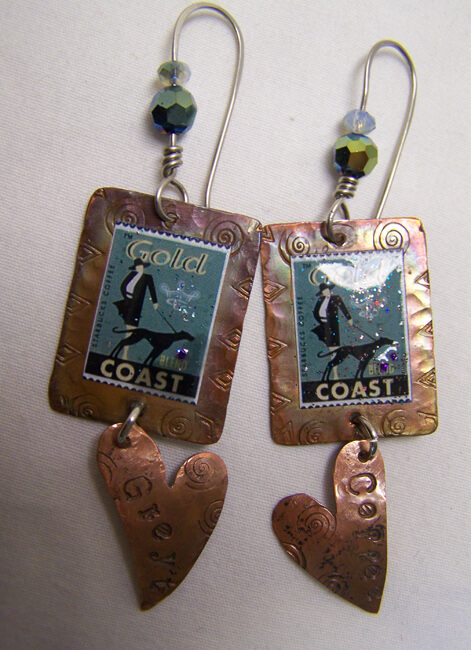 Earrings and heart charms are stamped and hammered pure copper, with the artist's hallmark on the back--an original Red Hot Kitties design! They are 2" long (excluding ear wires. The wires are hand forged nickel silver. The "Gold Coast" stamps are glossed with clear, sparkly resin, and the copper is finished with Renaissance wax to preserve the shine. Enjoy!